We have 2 classes in Quezon City this month! Make your New Year’s resolution to get fit stick by coming to class and learning to create delicious, healthy meals. Sign up and pay for 3 classes by January 5, Thursday and get 10% off! Sign up and pay for 1 class with 2 or more friends by January 5, Thursday, and get 10% off! Applicable to both Alabang and Makati locations, too. Learn how to make 4 beautiful, nutrient-dense, and immune-boosting salads that will knock your tastebuds off. You’ll get familiar with different vegetables, fruit, grains, beans, herbs, spices, and seeds that you can use to create the salads of your dreams. RATE: early bird rate of P1950 if paid by January 26 Thursday, P2250 after January 26 Thursday. We have 4 classes scheduled in Quezon City this October – all on Sundays. Sign up and pay for at least 3 classes by September 29, Thursday and get 10% off! Sign up and pay for a class with 2 other friends by September 29, Thursday, and get 10% off! Applicable to any of our locations. Transport your tastebuds in this class! Learn how to make authentic Thai dishes full of sweet, sour, salty, and spicy flavours using wholesome vegetarian ingredients. RATE: P1950 if prepaid by September 29 Thursday, P2250 after September 29. Early bird rate of P1950 if paid by Thursday, September 29, P2250 after September 29. RATE: P1950 if prepaid by October 13 Thursday, P2250 after October 13. One of the easiest ways to eat more veggies without really thinking about it is to drink them. In this informative 2-hour workshop, learn how your current lifestyle and diet can either be toxic or detoxifying to your health, and what you can do to change it. Discover how fruits and vegetables in liquid form can balance acidity, boost your immunity, increase energy, and support healing from lifestyle diseases such as cancer, diabetes, and heart disease. Learn how to incorporate superfoods and how to make juicing and smoothie-ing an effortless daily habit. This is one of my popular classes and one I don’t repeat too often. At the end of class, you’ll know what fruit and vegetables to use depending on what type of healing you need. RATE: P1550 if prepaid by Thursday October 13, P1850 after October 13. Sign up for a class with 2 other friends by September 29, Thursday, and get 10% off! We have 1 class scheduled for Quezon City this September! Sign up and pay for at least 3 classes by September 1 and get 10% off! Applicable to any of our locations. Hello, folks! We’ve got 4 classes scheduled in July. Take note they are all happening in 1 weekend. Sign up and pay for all 4 classes by June 24 and get 15% off! Make authentic-tasting and healthy dim sum favourites from scratch in D(IMSUM)-DAY. RATE: early bird rate of P1850 if paid by June 30 Thursday, P2150 after June 30. Sign up here! RATE: P1450 if prepaid by Thursday June 30, P1750 after June 30. Pasta is a staple in Italian cuisine because it cooks quickly and fills up your appetite quite nicely. But most pasta noodles are made with refined flour (which can spike blood sugar levels) and their sauces can be quite rich and unhealthy. In PASTA PARTICIPLE 2.0 class, discover how to make healthified versions of pasta favourites without sacrificing flavour, using vegetables, mushrooms, legumes, soy, nuts, herbs, and spices. RATE: P1950 if prepaid by June 30 Thursday, P2250 after June 30. Bring out your maracas and bandaritas in this fun cooking class! In TACO FIESTA, learn how to make a slew of Mexican dishes for the ultimate vegan party. We’ll make a bunch of stuffings and condiments from scratch, you won’t know what hit you! RATE: P1950 if prepaid by June 30 Thursday, P2250 if paid after June 30. To the northerners out there – we have 2 classes coming up this month at Back of the House in QC! We also have classes in Makati – for more info, click here for adults and here for kids. Who doesn’t love pizza? A healthy diet isn’t drinking green juice and eating salad all day. Guilt-free pizza is definitely achievable in your own kitchen – why pay someone to make you a tolerable vegetable pizza when you can make one (or 9) yourself that you will actually want to devour? 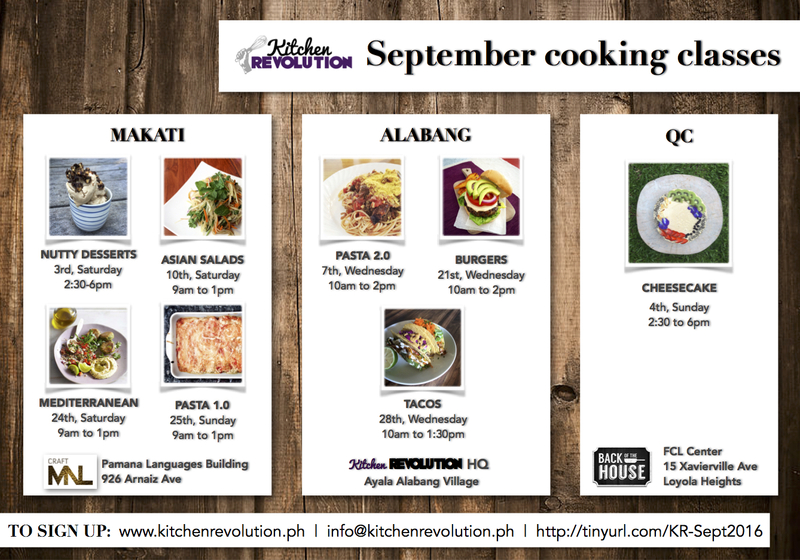 Pay the early bird rate by depositing to BPI CA # 1760-010231 under the name Kitchen Revolution. Credit card and Paypal options are available (add 3%) – please inquire! Hello hello! The KR crew is heading to the far north to teach 2 cooking classes in Quezon City! Super exciting stuff – people have been clamouring for them and I aim to please. Classes will happen on April 16 and 17 at Back of the House, a culinary event space in Loyola Heights. In BODACIOUS VEGGIE BURGERS class, learn how to make 4 flavourful burger patties using all-​vegetarian ingredients. We’ll also make condiments and toppings from scratch! In CHOCOHOLICS ANONYMOUS pastry class, learn how to make more healthful, dairy-free, egg-free, and cholesterol-free variations of well-loved chocolatey desserts. We will be using wholegrain flours and alternative sweeteners in the recipes.